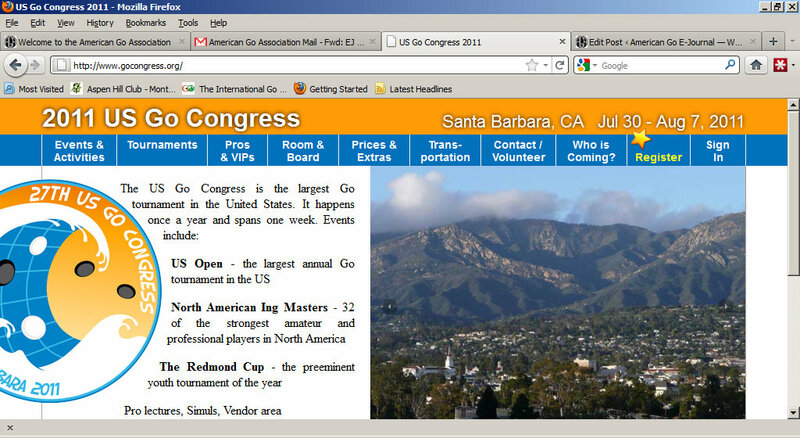 Sixteen professionals have been confirmed for this year’s U.S. Go Congress, set for July 30 – August 7 in Santa Barbara, CA. The line-up includes popular American-born professional Michael Redmond 9P (l), Feng Yun 9P, Seo Neong-Wook 9P, Wang Qun 8P, Kong Xiangming 8P, Mingjiu Jiang 7P, Yilun Yang 7p, Ryo Maeda 6P, Guo Juan 5P, Janice Kim 3P, Lee Ha-Jin 3P, Jennie Shen 2P, Cathy Li 1P, Huiren Yang 1P, Xuefen Lin 1P, and Li Ting 1P as resident pros at the weeklong Congress. “It’s great to be able to bring such a great group of professionals to the Congress,” says Congress Director Lisa Scott. “We’re committed to providing Congress attendees with as many opportunities as possible to attend lectures by pros and to participate in simuls with the professionals.” There are 376 people registered for the Congress, including 159 kyu-level players and 155 dan-level players. On June 1 2011, China’s Baoxiang Bai (in photo at right) won the 32nd World Amateur Go Championship (WAGC) with a triumphant clean sweep of 8 wins. South Korea’s Woo Soo Choi finished in second place with an impressive 7 wins – losing only to Bai in round 5. Arguably, Bai’s match with Choi in round 5 determined the winner of the tournament. Eric Lui of the U.S. claimed third place with 6 wins, the best-ever result for the U.S.
Interestingly enough, in last year’s 31st WAGC, China and Korea also met in round 5 to battle it out for the championship. Korea won last year’s championship (the 31st WAGC). Other than Choi, Bai also defeated Hirata of Japan (see below for a just-posted game commentary by An Younggil 8P of Go Game Guru on the game between Baoxiang Bai and Hironori Hirata), Wu of Chinese Taipei, Lui of the US, Rattanasetyut of Thailand, Burzo of Romania, Suponeu of Belarus, and Mezhov of Russia. The rest of the top 10 are as follows: Thomas Debarre of France, Hironori Hirata of Japan, Jun Fan of Canada, Franz-Josef Dickhut of Germany, Tsung-Han Wu of Chinese Taipei, Gheorghe Cornel Burzo of Romania, and Merlijn Kuin of Netherlands. The full results are available at EuroGoTV. Round 6 began at 1:30pm on May 31 with China’s Baoxiang Bai and Chinese Taipei’s Tsung-han Wu squaring off. One of those two was about to lose his unbeaten status. Next to Bai and Wu, Korea’s Woo-soo Choi was paired against Poland’s Kamil Chwedyna (photo at right). One of those two players was about to lose his second game of the day, after four straight wins in the first half of the tournament. 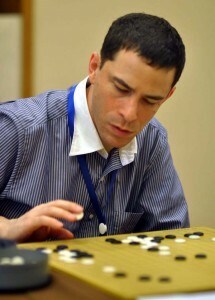 The Polish player drew white and placed his first three stones on the 9-10, 11-10, and 4-2 points, while the Korean occupied three corners. On three other boards in the main playing room, Japan’s Hironori Hirata was playing Spain’s Joan Flos, Thailand’s Choltit Rattanasetyut was playing Vietnam’s Kanh Binh Do, and France’s Thomas Debarre was playing Eric Lui of the US. The winners of these games would still be very much in contention, provided one of them could manage to beat the winner of the Bai-Wu game. In the outer playing area the Ukraine’s Mykhailo Halchenko had been drawn down against Romania’s Cornel Burzo. A win for the Ukranian would leave him in contention for the championship too. A win for the Romanian would mean a good chance at taking one of the top ten places, conditional on a strong performance tomorrow. Sixteen other players with 3-2 records were also playing for chances to finish in the top ten. With the stakes becoming increasingly clear, the pace of play slowed. Only a few games finished in less than two hours. Two of these ended in victories for Japan and Korea. At the two-hour ten-minute mark the Southeast Asian showdown between Thailand and Vietnam was also over, and in this game victory went to Thailand, by 9.5 points. Thomas Debarre and Eric Lui are both relatively slow players, and their game lasted longer. The winner was Eric Lui. His reward: a pairing against the Chinese player in round 7. In the outer playing area, the drawn-down game, another lengthy affair, was won by the drawn-up player, Cornel Burzo. Tomorrow he will first face Kanh Binh Do of Vietnam in a quest to restore Romania to a place in the top ten. In other pairings for round 7, Korea is matched against Chinese Taipei and Japan against Thailand. Round 7: At 9:30am on June 1, chief referee Masaki Takemiya (standing in photo at left) gave the players a cheery greeting, followed by the formal call to choose colors and start play. As in round 6 the pace of play was generally slow, but three games in the outer playing area ended quickly. Franz-Josef Dickhut of Germany picked up his fifth win by beating Joan Flos of Spain in less than an hour. Next a nine-stone handicap game between Madagascar’s Manitra Razafindrabe and referee Yasuhiro Nakano ended. Both players won, Nakano on the go board, Razafindrabe by getting a bye in the tournament. Shortly afterward Costa Rica’s Mario Miguel Aguero Obanda scored his second win by beating India’s Sandeep Dave. The first game finished in the main playing room was the match between Japan and Thailand. Thailand’s Choltit Rattanasetyut resigned at 10:40, giving Japan’s Hironori Hirata a sixth win and an assured pairing against Baoxiang Bai of China in the last round. A minute later, on a different board, Armenia’s Artak Margaryan 3k resigned against Azerbaijan’s Bahadur Tahirbayov 6D, and awhile later Zoran Mutabzja of Croatia lost to Mykhailo Halchenko of the Ukraine. Andrius Petrauskas saw his hopes of gaining a first-ever top-ten finish for Lithuania dim considerably when he lost to Canada’s Jun Fan. At 11:20 Israel’s Jonathan Lidor made one last attempt to resurrect a dead group, then resigned to Finland’s Mikko Siukola. Vietnam’s Kanh Binh Do chose to play out a long endgame, including a half-point ko, only to lose by a wide margin to Romania’s Cornel Burzo. Not many people witnessed these defeats, however. The spectators were massed at the front of the room where the games involving China, Korea, Chinese Taipei, and the US were proceeding. 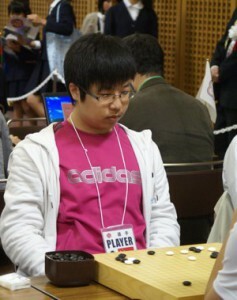 In the China-US game, Eric Lui had been struggling without success to attack a large group in the center of the board. He was now playing in his last renewable 30-second time period, which he repeatedly used down to the last second or two, eliciting protracted beeps from his tournament clock. At 11:43 he resigned, and China’s Baoxiang Bai took a big stride closer to a world championship. In the last game to finish, France’s Thomas Debarre defeated Czechia’s Radek Nechanicky. In the final round the French and Thai players are paired together, as are the players from China and Japan, from Korea and Romania, and from Chinese Taipei and the US. And outside, the rain for which Matsue is also famous has let up again. Round 4 of the 2011 World Amateur Go Championships (WAGC) began at 1:30p on May 30 with referee Yasuhiro Nakano giving the signal to start. With only seven undefeated players remaining, the competition was beginning to tighten up. Two of the three games among those undefeated players ended quickly. Choltit Rattanasetyut of Thailand made an early and serious mistake against Baoxiang Bai of China, and Morten Ofstad of Norway made a major mistake in the middle game against Tsung-Han Wu of Chinese Taipei, giving Bai and Wu easy wins. Wu, who said he had never played a European opponent before this tournament (“except possibly on the Internet”), rated Ofstad as fairly strong. Rattanasetyut was rated as considerably stronger than the Thai player who finished with four wins last year by Yuan Sun, a Chinese 3P player who had been a referee at the WAGC in Hangzhou last year and is assisting the Ranka staff this year. The third game between undefeated players, Woo-soo Choi of Korea against Eric Lui of the US (left in photo at right), proceeded much more slowly but ended without an upset. Choi said he was satisfied with having won a difficult game, and rated his opponent’s level as not much different from his own. Another undefeated player who won what he described as a difficult game was Poland’s Kamil Chwednya, who had been paired down against Belgium’s Jan Ramon. For the first time in this tournament, the Polish player played conventional opening moves. “Every opening has its own logic,” he said. Round 5: A light rain was still falling on the morning of May 31 as the players made their way, some on foot but most by bus, to the Shimane Prefectural Assembly Hall. First to take his seat in the main playing room, ten minutes before the 9:30 starting time, was China’s Baoxiang Bai (below), arguably the favorite to win the tournament. 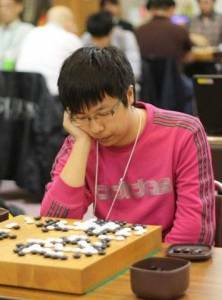 He has been making his mark on the Chinese national tournament scene since 2006, when he took second place in the Huanghe (Yellow River) Cup at the age of 13. The next year he won the amateur Qiwang (King of Go) tournament, in 2009 he won the amateur Dujuanha (Azelia) Cup, and in 2010 he won the Wanbao (Evening News) Cup. Those last two triumphs earned him the right to represent China at this year’s Korean Prime Minister’s Cup and the 32nd World Amateur Go Championship. 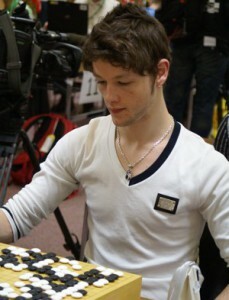 At age eighteen he is already recognized as one of the four top amateur players in China. Five minutes later Woo-soo Choi took the seat facing Bai. Choi is less well-known, having had no national triumphs until he won the Korean amateur Kooksu in 2010. In that tournament, however, he defeated Hong-suk Song, who had beaten Chen Wang, another of China’s top four, to become last year’s world amateur champion. The Kooksu victory made Choi this year’s Korean player at the World Amateur. Soon after Choi sat down, Chinese Taipei’s Tsung-Han Wu took his seat at the adjacent board, and at 9:30 on the dot Poland’s Kamil Chwedyna ambled into the main playing room and sat down facing Wu. Referee Yasuhiro Nakano then gave the signal to start. The game on the second board ended within an hour and a quarter. Black carved white’s position into pieces and captured two of them. Kamil Chwedyna manfully resigned and stepped out of the playing room, to be swarmed by a group of uniformed girls from the go club at the Okuizumo Choritsu Takada Primary School, who collected his signature on their programs. A rather older group of spectators had gathered around the board where Japan’s Hironori Hirata was playing Czechia’s Radek Nechanicky. This game ended with the Czech player’s resignation at 11:36. Some of the spectators now moved over to watch Bai and Choi play out the endgame of their crucial encounter. White had started well in the opening, but in the middle game white let black capture two stones in the center in a classic turtle-shell shape. The territory white took in return did not compensate for the power black gained in the center. Bai’s expression revealed nothing, but he said later that once he took those two stones he had felt confident of winning, and win he did, by 3.5 points, just before noon, as a crowd of close to thirty onlookers thronged around the board. At this point the only game still going was the one between Eric Lui of the US and Xiang Zhang of Singapore. It continued until nearly 12:40, with Eric Lui winning safely by 5.5 points. In the meantime France’s Thomas Debarre, Ukraine’s Mykhailo Halchenko, Spain’s Joan Flos, Thailand’s Choltit Rattanasetyut, and Vietnam’s Kanh Binh Do had also won their games to join Woo-soo Choi, Kamil Chwedyna, Hironori Hirata, and Eric Lui in the group with four wins. These nine will be fighting to stay in contention while the two remaining undefeated players, Baoxiang Bai and Tsung-han Wu, battle it out it in the afternoon round. THIS JUST IN: Click here for all the latest news from the 2011 World Amateur Go Championships (WAGC) live from Japan, including a report on Round 4 results, reported by our colleagues at Ranka Online, the bulletin of the International Go Federation. Round 2 of the 2011 WAGC started just after 1:30 on May 29 with all players present. This time the bye went to Mykhailo Halchenko of the Ukraine. The player with the bye receives a teaching game from one of the referees, so Mykhailo 5D found himself playing Yasuhiro Nakano 9P at two stones. This was a tough challenge, and Mykhailo went down to honorable defeat by resignation. In the real competition, six players now faced opponents of equal rank. The game between Thomas Debarre of France and Cornel Burzo of Romania, both 6D and hopeful of finishing in the top ten, was particularly intense. The winner, by 3.5 points, was Burzo, who earned a pairing against China’s Baoxiang Bao in the next round. In another duel of 6D players, Merlijn Kuin of The Netherlands triumphed over Franz-Josef Dickhut of Germany, and in a clash between two 7D players, Chinese Taipei’s Tsung-Han Wu overcame Canada’s Jun Fan. These four players are also expected to contend for places in the top ten. At the 5D level, Kanh Binh Do of Vietnam picked up his first win by downing former European champion Zoran Mutabzja of Croatia. At the 1D level, Francisco Pereira of Portugal overcame Michael Galero of the Philippines, and Aliaksandr Suponeu of Belarus bested Manitra Razafindrabe of Madagascar. At the 1k level, Miroslav Smid of Slovakia scored a win over Mario Miguel Aguero Obanda of Costa Rica. Unlike Round 1, round 2 produced some upsets. In one of the most unusual games of the afternoon, Kamil Chwedyna 4D of Poland used his patented second-line opening to defeat Viktor Lin 5D of Austria. In the closest game Salvador Larios 1k of Mexico squeaked past Hock Doong Ho 1D of Malaysia by half a point, and in the biggest surprise of the day, James Hutchinson 1k of Ireland upended Torben Pedersen 3D of Denmark. 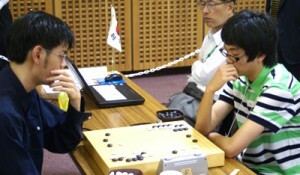 Round 3: Once again most of the spectators chose to watch the game of the Japanese player, Hironori Hirata (in photo at right). Yesterday they had seen him sail serenely past opponents from the United Kingdom and New Zealand, and this morning they expected him to do likewise against Morten Ofstad from Norway. For most of the game it looked as if their expectations would be fulfilled, but the Norwegian 4D did not give up easily and his perseverance was rewarded: a critical mistake in a life-and-death situation forced the Japanese 8D to resign. Mr Hirata accepted defeat with good grace and bowed in apology to his onlooking supporters. The spectators then moved into the outer playing area to watch the game between Chi-hin Chan of Hong Kong and Tsung-han Wu of Chinese Taipei, which was still in progress. The outcome was impossible to predict: both players are young and strong, both represent territories where go is booming among the younger generation, and the position on the board was tense. After a thrilling endgame it was Tsung-Han Wu, clad in blue jeans, a plaid shirt, and a black vest and sporting earrings, who walked away the winner by a point and a half. In another 1.5-point finish, Choltit Rattanasetyut of Thailand defeated Xiang Zhang of Singapore. The Thai player led throughout the first half of the game, but victory did not come easily: the lead changed hands twice before the end. These results left the players from Norway, Chinese Taipei, and Thailand undefeated. Joining them in the all-victorious group were Baoxiang Bai (China), Woo-soo Choi (Korea), Kamil Chwedyna (Poland), and Eric Lui (US), who defeated opponents from Romania, The Netherlands, Spain, and Slovenia in round 3. The Poland-Spain game featured another remarkable opening. Playing black, Kamil Chwedyna placed his first four stones in a pon-nuki shape in the center of the board; then he fought his way to a 6.5-point victory. In the next round the players from China, Korea, and Chinese Taipei will tackle the players from Thailand, the US, and Norway. On 24 May 2011, the Nihon Ki-in announced players who will take up the last four spots in the 36th Kisei League. Seto Taiki 7P of the Kansai Ki-in, Akiyama Jiro 8P, Kono Rin 9P and Kobayashi Koichi 9P. These players were selected based on playing through single knock out preliminary matches and will join top performers from the 35th Kisei League. The winner of the 36th Kisei League will earn the right to challenge Kisei title holder, Cho U 9P, in 2012 for the 36th Kisei. The 36th Kisei League players are Iyama Yuta 9P, Yamashita Keigo 9P, Hane Naoki 9P, Kato Atsushi 8P, Kono Rin 9P, Seto Taiki 7P, Takao Shinji 9P, Yamashiro Hiroshi 9P, Yoda Norimoto 9P, Ryu Shikun 9P, Kobayashi Koichi 9P and Akiyama Jiro 8P. On 26 May 2011, Joanne Missingham 5P, who plays professionally under her Chinese name, Hei Jiajia, turned 17 while playing in the 4th Taiwan Qiwang, a Taiwanese Go tournament. 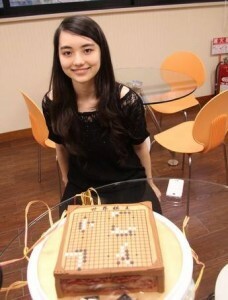 She received a received birthday cake in the shape of a Go board as a surprise gift from fans. The cake even had edible stones! Missingham’s rapid promotion (she was promoted to 2P in late 2010 and 5P in early 2011) has not escaped the notice of international Go bodies. Japan has invited her to take part in this year’s Nakano Cup, a prestigous tournament for under-20s. Previous winners of this tournament include none other than this year’s Judan and Bosai Cup winner, Iyama Yuta, who won the Nakano Cup in 2005, 2006 and 2007. On 28 May 2011, as a prelude to the 32nd World Amateur Go Championship (WAGC), Otake Hideo 9P played an exhibition match with local school girl Ohara Moeka in a Castle Game reenactment at Matsue Castle in Shimane Prefecture. Ohara was a quarter finalist at the Japanese Girls High School Go Tournament in the individual division and received a 3 stone handicap from Otake. 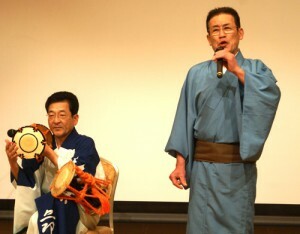 Both players donned elaborate kimonos to evoke the Edo period, during which the famous Castle Games took place. Shimane Prefecture was the birth place of two famous players – Honinbo Dosaku in 1645 and Iwamoto Kaoru in 1902. The playing area on the third floor of the Shimane Prefectural Assembly Hall is divided into a main inner room with nineteen boards, fourteen of which have official game recorders, and a smaller outer area with ten boards. In round 1 the solo seat went to Spain’s Joan Flos. The signal to start the games on the other boards was given by chief referee Takemiya Masaki just after 9:30a on Sunday, May 29, and live online broadcasts of four of the recorded games began immediately. Another World Amateur Go Championship (WAGC) was under way. photo at right: the Seicho Yasuragibushi Preservation Society gives a performance of traditional songs and dances, accompanied by drums and shamisen at the opening ceremonies of the 32nd annual WAGC. 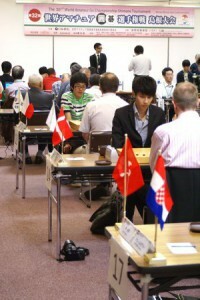 In the inner room, spectators gathered around Board 13, where Hironori Hirata (Japan) was playing Alexander Selby (U.K.). Next to them Thomas Debarre (France) was taking on Kanh Binh Do (Vietnam); this game also attracted attention. The tournament is being played with time limits of one hour per player, followed by three renewable 30-second overtime periods. Timing was handled by new tournament clocks, made by Citizen Corporation for the Nihon Kiin. The beep tones of the clocks provided a soft electronic background to the click of slate and shell on wood. Following WAGC tradition, in the first round the middle half of the field drew for opponents from the upper and lower quarters. At the end of the round, every game turned out to have been won by the higher-seeded player. Ranka asked its professional commentator Hiroshi Yamashiro 9P of the Nihon Kiin and referees Shimpei Kuwamoto 6P (also of the Nihon Kiin) and Yasuhiro Nakano 9P (Kansai Kiin) for their observations on the round. 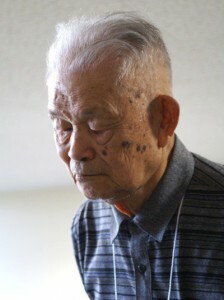 “They are strong,” said Shimipei Kuwamoto. “In the post-mortem reviews they were all very definite about their ideas. It was clear that they were bent on playing their own games. 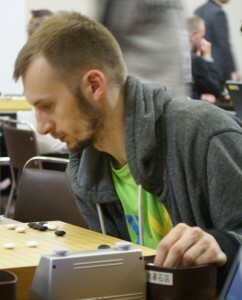 One player (Kamil Chwedyna, Poland) played several of his opening moves on the second line. At first glance it looked as if his hand must have slip ped, but he knew what he was doing. I guess he had worked this strategy out in advance.” Chwedyna won his game. “The age range was impressive,” noted Yasuhiro Nakano. Aside from 84-year-old Hironori Hirata of Japan, there are quite a few players in the 50-70 age bracket, and then there are the young players from Southeast Asia. “It will be very interesting to see how strong the ones from Indonesia (14), Singapore (22), Thailand (21), and Vietnam (22) become,” said Nakano. 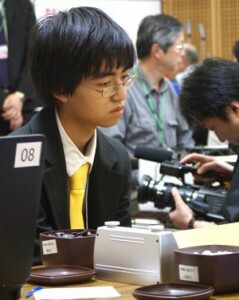 The players from Indonesia, Singapore, and Thailand won their first games, as did Hironori Hirata. - James Davies, Ranka Online; click here for his complete report. Note: the American go E-Journal team of Chris Garlock and John Pinkerton was unable to attend this year’s WAGC due to a family emergency. This is the LAST WEEK to receive the full discount for the 2011 US Go Congress! Sign up by June 1 at www.gocongress.org!